When you want library resources, do you typically think about looking for them in databases? Do you search the CUNY+ catalog for a book? Explore the Library’s growing streaming video collections by going to Films on Demand or one of the Alexander Street video databases? Or do you just head directly to a favorite database like JSTOR, PsycINFO, Project Muse or Google Scholar? Chances are that you have your list of go-to sources and have not thought much about library databases on a more macro-level. If you did, one of the first things you would discover is that the majority of library databases provide access to scholarly journals—those peer reviewed, academic journals that are often required sources for papers and research projects, particularly in upper level courses and graduate work. You would also discover that despite the abundance of these journals in the scholarly literature landscape, the vast majority of them are now only available electronically through libraries. In other words, opportunities to cozy up with your favorite academic journal are fleeting. Much to the chagrin of journal editors, most of these journal articles are discovered as the result of keyword searches in databases, without any links to the journal issue. Our speed-of-light, get-it-anywhere-anytime-online delivery methods provide access to these articles, often as an easy-to-access PDF—but without the context of the journal issue. BrowZine, the Library’s newest tool for browsing journals, is trying to change this. We think this is a good thing, since every year students and faculty at John Jay download the full text of about 1 million journal articles... and context matters! 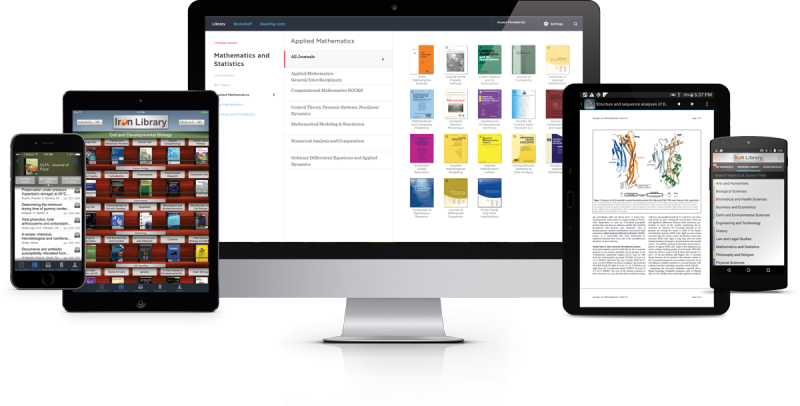 BrowZine allows you to access and browse over 15,000 academic e-journals, much like you might browse their print counterparts. In BrowZine, you can find any academic e-journal title that the Library subscribes to that has an ISSN or eISSN number. BrowZine operates in a web environment but it uses journal covers and journal page images that have the look and feel of a bookshelf. It has been compared to Flipster, an app for browsing popular magazines (available remotely to all NYPL library card holders), but for academic journals. BrowZine has a web version and mobile apps. All platforms allow you to view complete issues of e-journals that the Library subscribes to, dating back to 2005, including the table of contents. The web version provides access to more content because it provides extra links to content through the Library website. The web version also shows the impact factor for the different journals. The app version focuses exclusively on the approximately 15,000 academic e-journals that have an ISSN or eISSN number, and is great for tracking and reading your favorite journals on the go from your phone or tablet. To access the web version of BrowZine, you can go directly to browzine.com. Alternatively, you can go to the Browse journals by subject link under Journal titles on the library website. For the app version, download the mobile app on your iPhone, iPad, and Android devices. Select the John Jay College library on the “Settings” page and then enter your John Jay user name and password—the same that you use for your John Jay email. How do I use BrowZine? You can search for journals by title, subject, or ISSN. Once you begin typing in the search box, a list of results will begin populating. Be sure to pay attention to the accompanying icon for a particular result. A red file icon indicates that this result is for a subject category. A blue book icon indicates that the result is for the title of a specific journal. 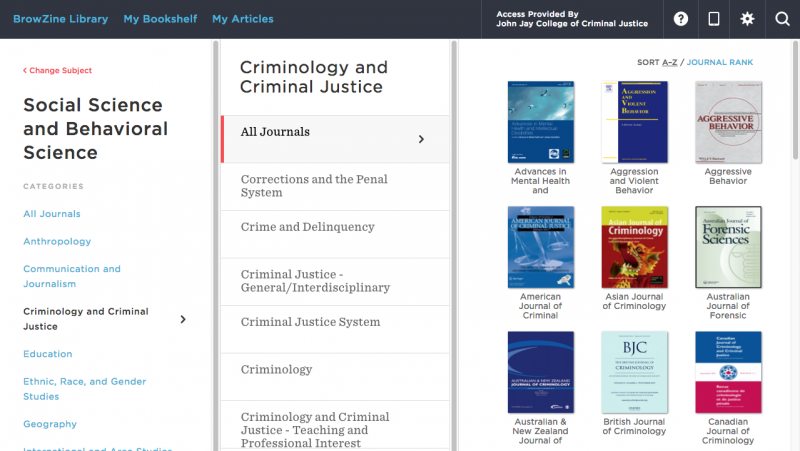 For example, a search for “criminal justice” will retrieve both subject category results and journal title results. Set up a personal account so you can create a personal library and save up to 64 journal titles to your bookshelf. By doing so, you will get alerts when a new issue of a journal is published and be able to save articles to read later, even when you are offline. You can also save citations to tools like Zotero, RefWorks, Dropbox, and Mendeley to help keep all of your information together in one place. Should I use BrowZine with students? A common complaint from faculty is that students are not selecting appropriate sources. By introducing students to BrowZine, which only accesses academic journals, they can only get scholarly content. Furthermore, by introducing students to journals, and not just journal articles, BrowZine can be used to put journals back in context for students who are frequently unfamiliar with academic journals and how they are used for scholarly discourse within a discipline. Consider asking students to follow certain journals in a subject area and identify current areas of research. This will familiarize students with key journals in a field and encourage them to select articles of interest from the recent literature. All subject and journal URLs in BrowZine are persistent links, so connecting students to journals in BrowZine is easy. Simply copy and paste the URL from the address bar into your syllabus or Blackboard course. Keep in mind that BrowZine is a browsing tool, not a discovery tool. You cannot conduct keyword searches to find articles in BrowZine, and it should not be used as a substitute for a comprehensive search of the library literature. For more information about getting started with BrowZine, consider viewing a very short video. Once you get started, we look forward to your feedback!